Norwich City were facing the challenge of Newcastle United on Saturday at Carrow Road; neither side has won in their last 4 games so it was always going to be a tight game. 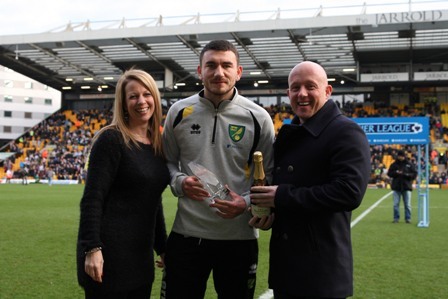 Before the match commenced, Robert Snodgrass was awarded the Anglian Home Improvements Player of the Month for the Canaries. The game was rather unspectacular as neither side was able to penetrate the defence and create a clear-cut chance. Gabriel Obertan came close in the first half, but his shot in the penalty box was well saved by Bunn. Although Norwich dominated the first half, they couldn’t find the final ball to break the deadlock. The second half was just as underwhelming as the first half and despite a fantastic 30 yard volley from Russell Martin, which struck the outside of the post, the game seemed like it was always going to be a 0-0 draw. Tim Krul kept Newcastle in the game late on, keeping Pilkington’s close range effort out. Norwich will be pleased to see Grant Holt return to the squad for this game, although the Canaries’ talisman couldn’t grab a winner. 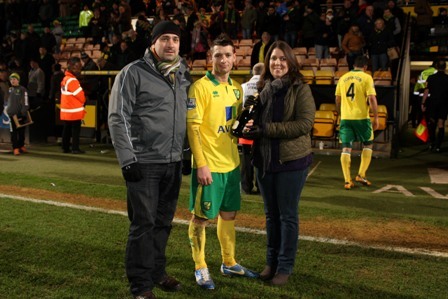 Wesley Hoolahan was named the Anglian Home Improvements Man of the Match for a good performance in the middle of the park.